Standards, easy listening, musical theater, as well as Latin and Celtic pop. 10. Are You Ready Now? Ava Victoria, the Hybrid Songbird, once again lets loose her ecclectic tastes. CD 2, KICKIN' UP LIFE, following CD 1, HYBRID SONGBIRD, with its mix of nylon string finger style guitar, rhythm folk guitar, poignant ballads, and classic show tunes on both guitar and piano is a real mix. There's a nice selection here of tunes with guitar, harmonica, accordion, cello, English horn. The piano selections have accordion, trombone and cello and French horn. The arrangements are unexpected, some soothing and others driving. You decide what serves your mood at any given time. You won't be disappointed. Each tune is a surprise! If you appreciate the human voice in song (unassisted by technical enhancements) then you'll get much joy from both these offerings by Ava Victoria. The theme that weaves both collections together is a love for American musical theater and the intimacy of the cabaret setting to showcase this music. As you look over the selections and their composers you will recognize some very familiar names but many with the added treat of their less familiar origins. Some of these songs, a bit obscure unless you're fluent in musical theater, offer added surprise in the way Ava Victoria gives even the standards a fresh coat of paint. Each gives her an opportunity to reveal the soar and range of her voice, and in many instances highlights her guitar playing, all within the feel of the cabaret. The thoughtful arrangements serve also to balance the presence of brass, cello, harmonica and assorted other instruments, all called upon when needed to complete the portrait. It's noteworthy that while some of these offerings may be anchored in the past, and yet still poignant decades after their popularity, are equally available to us in the present. Again, if you are seeking the closeness of a performer in an intimate setting then both of these albums will satisfy that need. And you can have it without dressing up, leaving the ease of your living room sofa or the one-on-one of your personal media player. If, on the other hand, you exist for the high-decibel squeal of an electric guitar, the trance of the synthesizer or generally crave to thrash about, you won't find that here. Thank you for your reviews!! The time you take to give a review to my CDs is appreciated. Any song that pleases you is worth the mention to me. Please know that CDBABY assures me that your account info is protected. I've asked many times about this. So, write and review to your heart's content. It gives me an idea what to include on the next CD. Just close your eyes and let the music soar through you. This CD carries you into another world -- the pure pleasure one gets from listening to Ava sing and play is a rare experience. Every song is a gem -- my particular favorites are "Just Go to the Movies" and "Here's to Life," both of which I have moved into my Favorites playlist in my iPod. Another amazing recording by Ava Victoria. You get a complete sense of what is special and unique about American cabaret singing with Kickin' up Life. Ava's expressive voice and phrasing will tranport you to a place inside yourself where you can start to remember some of who you really are and what is beautiful about this kind of expression. It's just wonderful. Ava Victoria's impressive artistry shines through with CD #2, "Hybrid Songbird Kickin' Up Life" and we are blessed! Ava's versatility as a singer, arranger and musician is tremendous. In the Cabaret market today I don't know of a better marriage of voice with guitar. Ms. Victoria's choice of instrumentation throughout this CD is totally unique and masterful. All of her numbers burst with integrity and heart. Ava's voice is simply extraordinary; she leaps, punching out a beautiful high belt, to singing a lovely ballad in a seamless, effortless and sultry way. "I Belong Here" and "Here's to Life" are riveting renditions. "Hybrid Songbird Kickin' Up Life" is a celebration of the great artistry of Ava Victoria. Ava Victoria's impressive artistry shines through with CD #2, "Hybrid Songbird Kickin Up Life" and we are blessed! Ava's versatility as a singer, arranger and musician is tremendous. In the Cabaret market I don't know of a better marriage of voice with guitar. Ms. Victoria's choice of instrumentation throughout this CD is totally unique and masterful. All of her recordings burst with integrity and heart. Ava's vocal performance is simply extraordinary; punching out a beautiful high belt in one piece to delivering a lovely ballad in a seamless, effortless yet sultry way. "I Belong Here" and "Here's To Life" are riveting renditions. 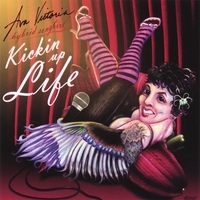 "Hybrid Songbird Kickin'Up Life" is a celebration of the great artistry of Ava Victoria! Indulge Yourself! We loved the first CD HYBRID SONGBIRD and now the second CD "KICKIN UP LIFE" is taking over. We just don't get bored...back and forth from really fine piano players and then to Ava's guitar pieces...well we just love it all. "Isn't This Better" is beautiful with guitar and cello. Ava's lovely, pristine voice is quite amazing to listen to. Down to the last detail, the last inflection, the carrying through each note to the end with grace and precision is captivating. Ava expresses the lyrics so sensitively. I was enthralled with her rendition of For No One. Quite remarkable. Ave blends a strong folk quality with cool, warm, and lots of colors. This CD has musical theater songs that are surprizingly well matched to the guitar....well a good song can't help finding a good singer-musician. This gal really can pick 'em. The guitar arrangements are so infused with the right attitude for the songs. I BELONG HERE sounds like something out of an American song book of small town favorites. ISN'T THIS BETTER is a shameless honest confession. My appreciation for fine guitar playing and Musical Theater haved moved up a notch since finding this lady. Songs that tell a heart's story are so appealing. MORE AVA, a lot more. Ava did a Cabaret fundraiser recently. She gave it all away, all of it and threw herself in with it. She paid the musicians and even gave a percentage of her CD sales to us. She sold a lot. The show was 75 minutes that went by so fast we couldn't believe it. It was filled with humor, fire and real sentimental value. This CD has some of the lovely songs she did UNPLUGGED; "Isn't This Better", "Once Upon A Time"...really held my attention. WE LOVED IT! We have the first CD and we love them both at home or in the car or in our i-PODS.